Detail from the model of the K11 kerbstone, showing decorative carving on the rock surface. The archaeological complex at Knowth, located in the Brú na Bóinne World Heritage Site, consists of a central mound surrounded by 18 smaller, satellite mounds. These monuments incorporate a large collection of megalithic art, primarily in the form of decorated stones lining the mounds’ internal passages and surrounding their external bases. The megalithic art found at this site constitutes an important collection, as the Knowth site contains a third of the of megalithic art in all Western Europe. The kerbstones surrounding the main mound at Knowth, while protected in winter, sit in the open air for part of the year, and are consequently exposed to weather and subject to erosion. The Researchers at CAST, in collaboration with UCD Archaeologists and Meath County Council, documented the 127 kerbstones surrounding the central mound at Knowth over the course of two days using close range convergent photogrammetry. This pilot project aims to demonstrate the validity of photogrammetry as the basis for monitoring the state of the kerbstones and to add to the public presentation of the site, incorporating the models into broader three dimensional recording and documentation efforts currently being carried out at Knowth and in the Brú na Bóinne, including campaigns of terrestrial laserscanning and aerial lidar survey. The k15 kerbstone is available here as a sample dataset. You can download the 3D pdf (low res) or the DAE file (high res). Photogrammetry data from this project was processed using PhotoScan Pro. 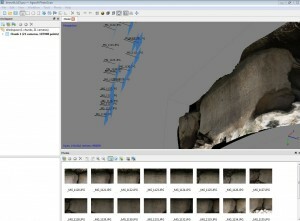 Photoscan Pro processing of the model for the K15 kerbstone. Please cite this document as: Opitz, Rachel. 2012. Knowth Photogrammetry.CAST Technical Publications Series. Number 10317. http://gmv.cast.uark.edu/region-data/data-photogrammetry/knowth-photogrammetry/. [Date accessed: 22 April 2019]. [Last Updated: 22 March 2018]. Disclaimer: All logos and trademarks remain the property of their respective owners.